How Are Bulletproof Vehicles Made? 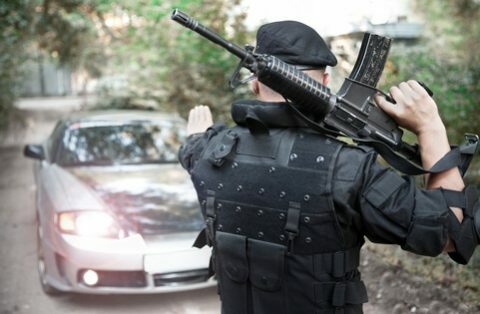 Manufacturing bulletproof and armored vehicles that offer superior security and protection involves more than just adding a few metal plates to an existing car or truck design. Constructing effective bulletproof vehicles requires expert knowledge of ballistics, explosives and tactics that could be used by potential attackers, as well as mechanical expertise. That said, armor reinforcement is the basic component that shields the occupants of a bulletproof vehicle from harm. Anyone who rides in a properly armored vehicle will be surrounded by a protective shell made from multiple plates of corrosion-resistant steel, steel alloys or special composite materials. The thickness of the material incorporated into armored cars is much greater than the sheet metal used in ordinary vehicles. In a vehicle built to withstand highly penetrating ammunition fired from powerful assault rifles, the armor thickness can exceed a quarter of an inch. Ballistic fiberglass or fabric liners can also be added to provide an extra layer of protection. A bulletproof vehicle can be custom-built from the ground up by welding armor to a bare chassis, or it can be a modification of a production vehicle. In the latter case, the interior of the car, truck or van to be modified is virtually stripped bare to allow armor to be added to its walls, roof, pillar posts, firewall, doors and floor. The addition of strips of armor called door overlaps seals the vulnerable seams between the doors and the body. Some armoured vehicles also have a steel barrier between the driver’s seat and the passenger or cargo compartment. But however well-protected from weapons its passengers are, a bulletproof automobile or truck can only provide temporary security if it’s rendered immobile. It’s vitally important for a bulletproof vehicle that comes under attack to be able to speed its occupants away from the scene of violence to safety. Thus the essential mechanical components of the vehicle must be protected, too. Its electronics and computer controls, battery and radiator are all be shielded with armor. The gas tank can be armored and fitted with a self-sealing bladder as well, which both stops the loss of fuel and reduces the chance of a fire or explosion. Because tires are so vulnerable to gunfire, bulletproof vehicles have run-flat tires that will continue to function for a time even if the outer rubber has been punctured. Often, heavy-duty ramming bumpers are welded to both the front and rear of the vehicle so that it can push its way through attempts to block the road. The problem that all of these armoured vehicle modifications create is the added weight. Accordingly, an armoured vehicle’s suspension must be beefed up to bear the increased load. Brakes must also be upgraded so that they’re capable of stopping the greater mass of the modified vehicle. Armored doors are so heavy that a third hinge must be added to each one to support the extra weight. For 20 years, The Armored Group LLC has been constructing armoured vehicles for a worldwide clientele. We manufacture and service a wide variety of bulletproof cars, armored vans and armored trucks. We also sell quality used armored vehicles. For you or your organization’s security needs, contact the professionals at The Armored Group LLC or call 1-602-840-2271.